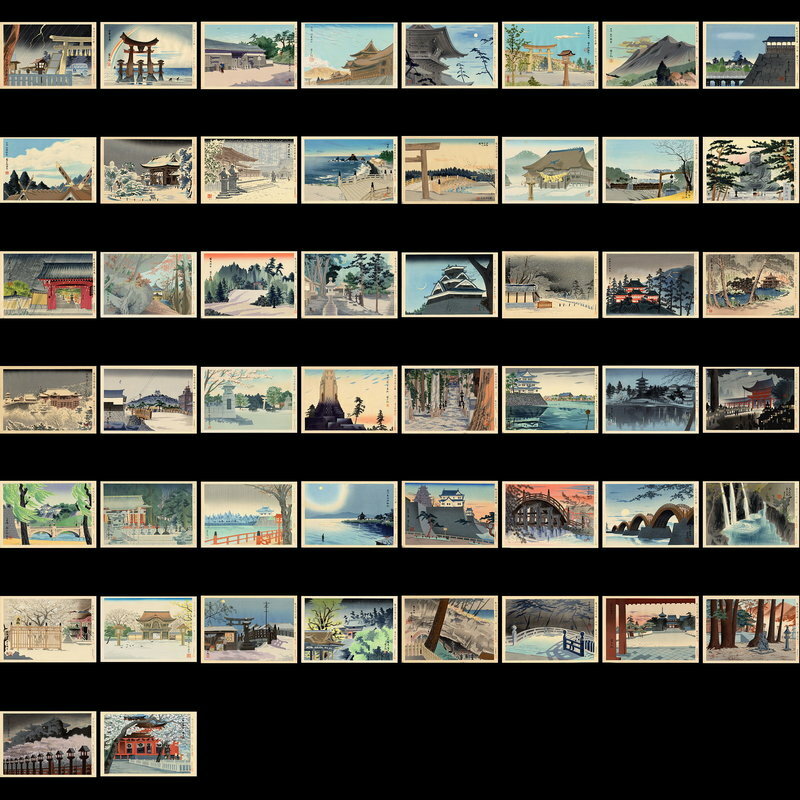 Tokuriki, Tomikichiro "Complete album set" - Woodblock - Chinese and Japanese woodblock prints for sale, silkscreen, scrolls, watercolor, lithographs. Artwork Details for Tokuriki, Tomikichiro "Complete album set"
Condition: Prints are mostly in rarely-seen fine condition; a few have very minor marks or spots. No prints have any major condition problem. Many prints have strong embossing. The album case has some slight wear. Notes: A complete album set of the series "Scenes of Sacred Places and Historic Landmarks". Included are 50 prints, a T.O.C., two other sheets with writing, and the original canvas and wood album case. Each print is still mounted in its original series folder; I've covered the front of each print with conservation-grade pH neutral tissue paper to protect them from folder matte burn. Price includes free shipping with full insurance and tracking. Complete sets like this are extremely rare because they are unfortunately broken up and the prints sold individually by dealers and collectors. For this reason I am only willing to sell this set to a collector who is prepared to make a commitment to keep the set intact and pass it to its next "caretaker" intact. To purchase this set please see here. You can see my personal copy of this album set here. TOKURIKI TOMIKICHIRO(1902 - 1999) - Tokuriki was born and raised in Kyotoand was influenced by the local art scene from childhood. He stayed in Kyotofor his entire career and was a leader of the Kyoto Sosaku Hanga. He graduated from the KyotoCity School of Fine Arts and Crafts and after that from the KyotoCity Specialist School of Painting. While he began his career in the painting field, he found his true calling in the woodblock print field and was enthusiastic about the reemergence of woodblock prints in 20th century Japanese art. He was influential in the development of new artists later in his career and set up his own publishing company called Matsukyu.